It can be difficult to know how to proceed when installing a washing machine for the first time, and we get lots of calls from customers who need our assistance. If you are planning on doing the job yourself, you should always read the manufacturer’s instructions first, as machines vary. Here are some useful tips to get you started. Where to install a washing machine? It’s important to get this part right, so it’s worth spending a little time considering the position which is least likely to cause you problems in the long run, and which will be convenient on a daily basis. For example, it might be useful for your washing machine to be installed near to your tumble dryer or near to where you wish to hang your clothes, or perhaps you’d like to keep it out of earshot of the places you like to relax in most. Ideally you will want to place the washing machine by an exterior wall, this will ensure you won’t have a waste pipe running through your home. If you want to install your washing machine upstairs with a hot water supply, make sure there is enough water pressure upstairs to enable it to work efficiently throughout a wash. You can call aspect.co.uk to check this if you are unsure; our plumbers will be able to assess your upstairs water pressure. 1. For your washing machine to connect to both the hot and cold water supply, you will be given two 1.5m long hoses with screw connectors at either end. Follow the maker’s manual to connect these to the machine. 2. In order to fit your machine to the water supply, you can use self-cutting valves. These will attach to the hot and cold pipes without you needing to turn off the water supply. If you are replacing an old washing machine you will not need to do this as the fittings will already be in place. 3. Be sure to fit isolation valves when you install the machine, as this will allow you to stop the appliance without cutting off the water supply. 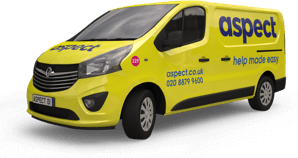 If you do not have an electrical socket nearby, you will need a qualified electrician such as the ones who work for aspect.co.uk to install one for you. Washing machines require a standard 13 amp electrical socket. The waste hose will need to be hooked into the standpipe of the machine. Then, you can either attach the hose to a sink using a washing machine trap, or you can use a waste outlet, by pushing the pipe into the waste pipe, which is connected to the house’s sewer system. If you have any questions about installing a washing machine, or you would like our help to install yours or do carry out any repair or maintenance work, call Aspect today and we will be happy to send over one of our professional plumbers to help.